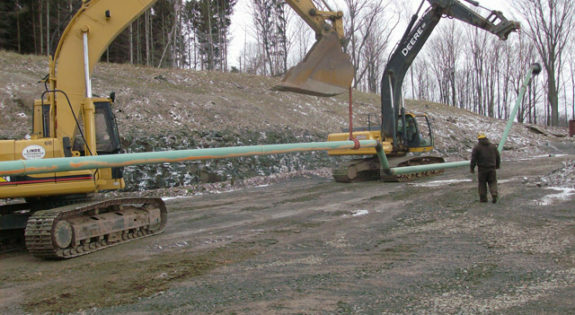 Linde has laid hundreds of miles of natural gas pipelines in the Marcellus region of Pennsylvania. 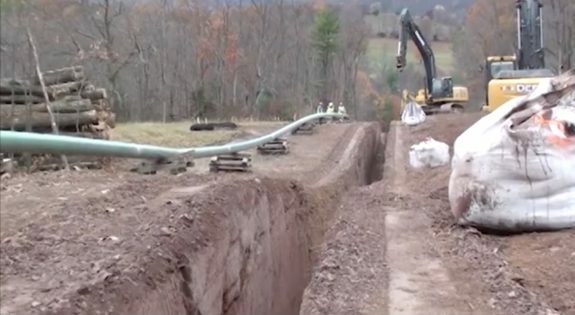 A pipeline spread resembles a moving assembly line. 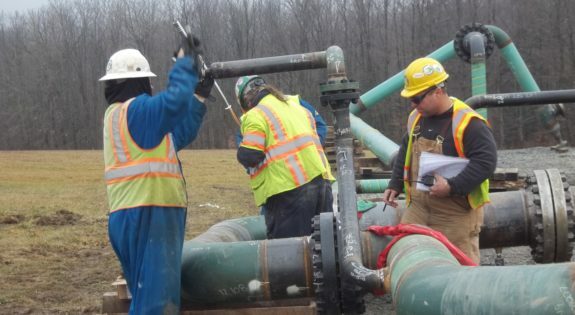 Each component of pipeline is built by a specialized work crew, each with its own set of duties. These are outlined below. As each crew completes its work, the next crew will move into position to complete its section of the construction project. 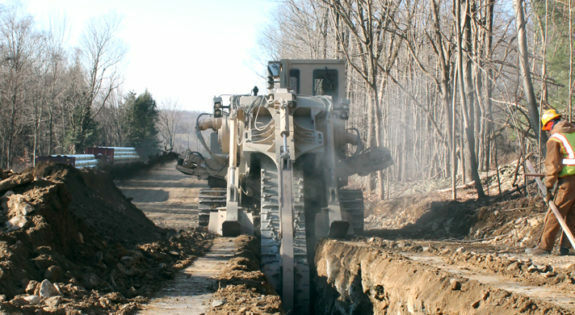 A pipeline spread may cover several miles, with the front of the spread clearing the right-of-way and the back of the spread restoring the right-of-way. Linde employees have a simple credo when it comes to work on the job. “Zero-zero.” That is, we aim for zero incidents and zero accidents on every job site, every day. We accomplish this through commitment, training and staying on top of changes within the industry. Once we have protected our people, then we protect the environment. Linde Corporation places enormous importance on this “first step” in the pipeline spread process. 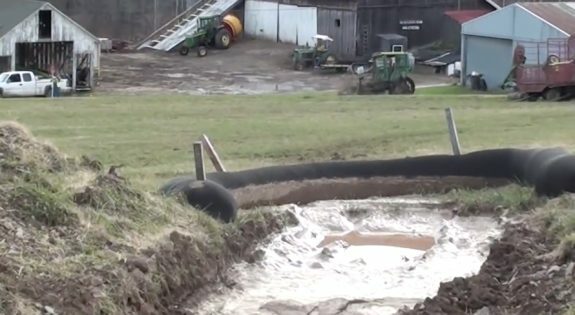 Before ground can be broken, preventative measure need to be taken to control erosion and eliminate sediment from being carried by runoff into neighboring streams and waterways. 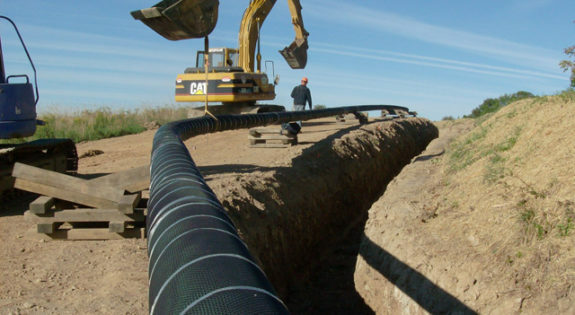 The standard methodology is to use silt fence, or composite filter socks. A filter sock is a fabric tube, typically filled with wood chips or compost. Silt socks and silt fences allow water to flow through at a controlled rate while trapping sediment and protecting our waterways. Before a pipe trench can be dug the land must be cleared and grubbed. 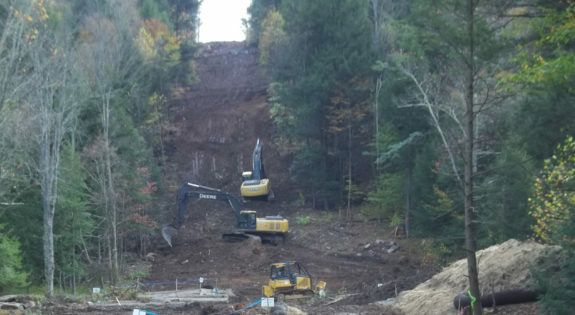 Linde has the a full fleet of excavators, bulldozers, and specialty equipment to expedite this job and keep ahead of the pipeline crew. 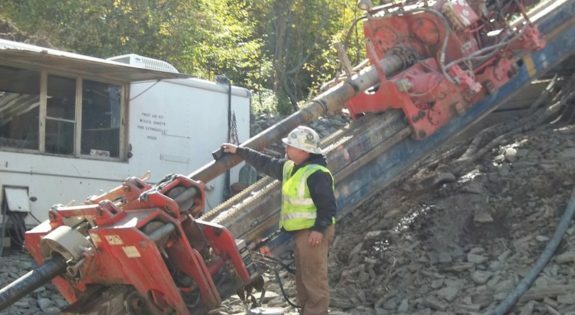 To maximize the efficiency of the pipeline spread, Linde utilizes their Tesmec trencher to excavate through both rock and soil with ease. 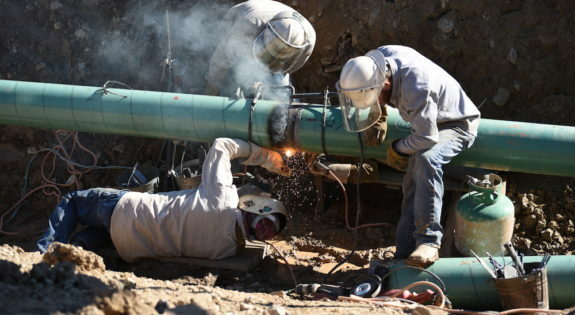 Before being laid in the trench¸ lengths of steel pipe are welded together by our team of seasoned, certified welders. 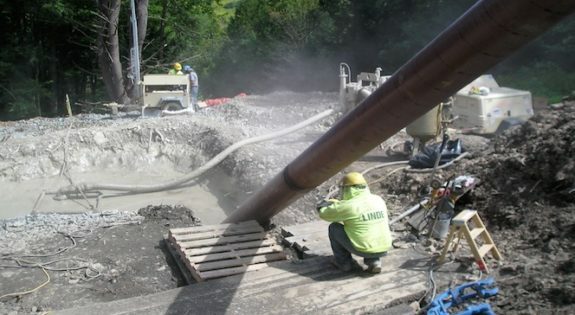 Seeing a football field length of solid steel pipe, curving around bends, being simultaneously lowered into a trench by a team of excavators is truly a sight to be seen. However, this is just another day at the office for Linde’s pipeline team who works in synchronization like a well oiled machine. 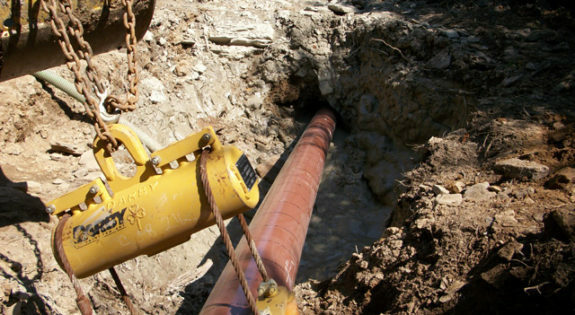 Before the pipe can be put into service, the pipe has to be tested to ensure that there are no defects from the factory, nor leaks that may have resulted from the installation process. Linde has trained experts in hydrostatic testing. Once the pipe is in the ground, we’ll grade, reseed and even landscape the disturbed area to get it as close to possible to what it was before we broke ground. 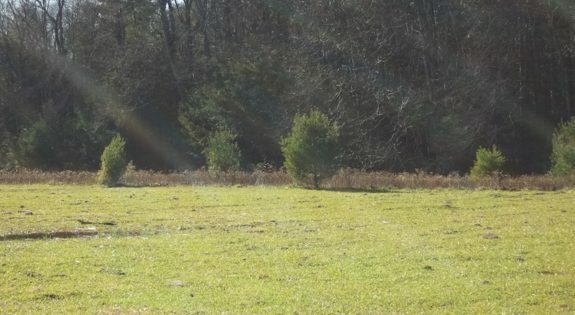 In some cases, like the picture to the right, the land was actually improved with a special type of grass at the request of the land owner. 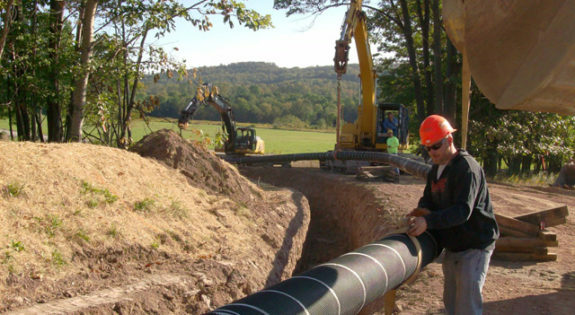 Trenchless technologies, and specifically horizontal directional drilling (HDD), is a key component of the pipeline industry, especially in Pennsylvania. However, the geological makeup here requires specific experience and expertise. 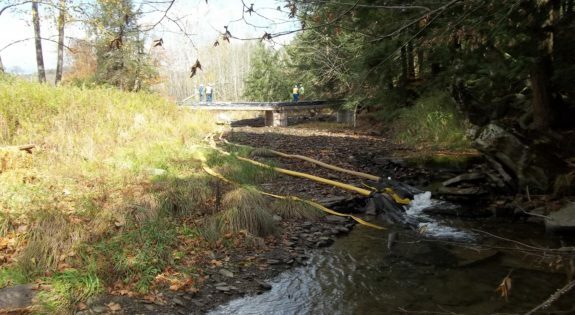 That, combined with the ever increasing environmental concerns, are leading to more frequent and longer bores to circumvent wetlands and other environmentally sensitive areas. 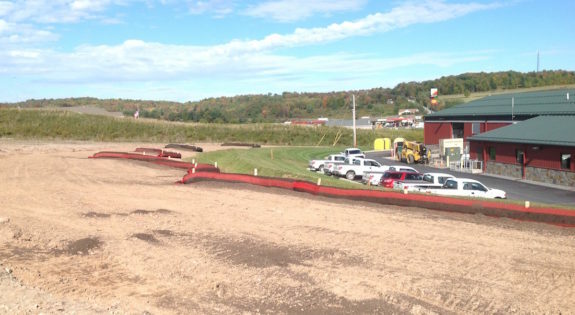 Linde has the specific knowledge of Pennsylvania, plus the experience and expertise for a successful horizontal directional drilling project. Conventional bores are performed in one of two manors; auguring and ramming. Auguring is performed with a rotating drill head, but unlike HDD, it is only for a straight-line profile of perhaps 30-100 feet. Typically this is reserved for situations with cohesive soils. 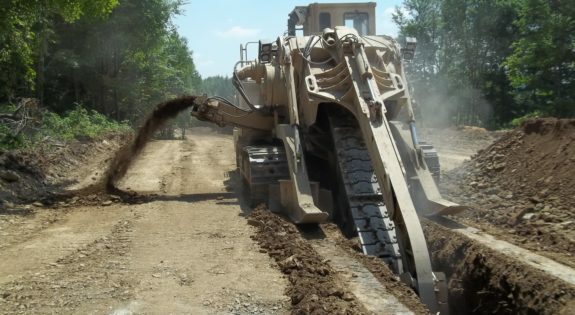 Ramming is used for the same purpose in cohesive soils but can also be used in mixed sand and gravel applications. 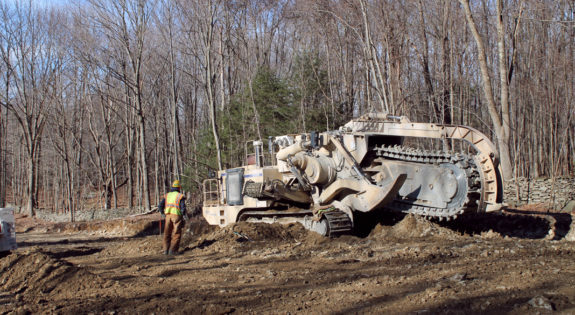 Ramming tends to be more dependable and economical for short distance bores, but all methods pale in comparison to the capabilities of HDD.